Mr. Reed presented on the transition to a successful career in engineering during and after college, providing tips on what an individual should look at for a job. This includes deciding whether to work in a specialized or diversified firm, the personality of potential co-workers, and the company mission values, among other tips. To conclude, Mr. Reed advised members to manage their own expectations in a potential job, to exceed others expectations, and to keep expanding their knowledge in the field. If you are a member and have not picked up this year’s T-Shirts, please come by to the next meeting. UCLA invited ITECPP to a technical tour at the Burbank Airport on February 21. ITECPP recently went to the ITE Student Leadership Summit at Cal Poly, San Luis Obispo; the summit was a great opportunity to network with students from other universities and professionals within the area. Online registration for UCTC Conference is now available! For more information, check out the website: http://uctc2014.atscpp.org. See you at our next meeting (last of the Winter Quarter) on Thursday, March 6! Superintendent of Schools and Riverside County Office of Education to support the K-12 Science/STEM Education program. Elementary, middle school, and high school students from surrounding counties with an interest in math and science were in attendance to learn about the many different fields in math and science.The Science Fair EXPO consisted of consultations, presentation, exhibitor booths, and workshops. These were hosted by teachers, professors, high school and college students. ITE’s first meeting is this Thursday, Oct 3rd during U-hour (12-1PM), in the Transportation Lab (17-2646). We will be hosting Zaki Mustafa as our guest speaker. He will be discussing how the Los Angeles Department of Transportation operates and also how to get ahead and succeed in life. Free lunch will be provided on a first-come first-serve basis. Don’t miss out on this opportunity! Zaki Mustafa, P.E., is the Principal Programs Engineer with the City of Los Angeles and is in charge of Project Delivery. He has been with the City for 29 years. He manages a staff of 155 professionals and has a budget of over $250 million. He is responsible for the delivery of the capacity enhancement and streetscape improvements, pedestrian and school safety improvement projects, Signal Synchronization program, prepare engineering plans for various traffic control devices such as traffic signals, speed feedback signs, left turn arrows, and striping plans for City streets, project management of all Measure R transit capital projects, traffic impact studies review site specific development projects for CEQA clearance purposes, and the implementation of the City adopted Bike Plan. Prior to this assignment he was the Chief of Field Operations with a staff of 275 professionals and a budget of $30 million. Mustafa has been very active with the Institute of Transportation Engineers for more than 30 years and served at all levels of ITE leadership: as a Student Chapter President, Section President, District President, International Board, International Vice President and currently serves as the International President. General Meeting featured guest speaker Mr. Zaki Mustafa, P.E. from the Los Angeles Department of Transportation (LADOT). his presentation on the “Keys For Success” to an audience of students and faculty. Mr. Mustafa’s stressed the importance of growing strong communication and technical skills, but also urged his audience to pursue volunteer opportunities and other involvements within Transportation Engineering before graduation. Mr. Mustafa concluded his presentation by offering the latest news and happenings within LADOT. 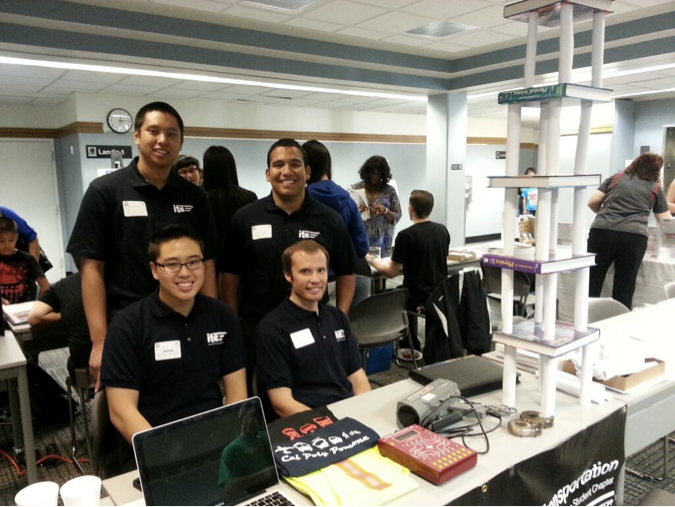 ITE’s second meeting is this Thursday, Oct 11 during U-hour (12-1 PM), in the Transpo Lab (17-2646). We will be hosting Zaki Mustafa as our guest speaker. As the newly elected President of ITE, he will be discussing how the Los Angeles Department of Transportation operates and also how to get ahead and succeed in life. Free lunch will be provided on a first-come first-serve basis. Don’t miss out on this opportunity! The key note speaker for lunch will be Christine Eary, Associate Planner SANDAG, who will be speaking on “Safe Routes to Transit and Data Collection/Modeling Work”.